Like dental crowns and teeth whitening treatments, dental veneers fall into the category of cosmetic dentistry. You can use them to cover up blemishes on your teeth, or even to enjoy a whiter smile. Continue reading if you’d like a look at the dental veneer process. Before you can get started with a cosmetic dentistry treatment, you need to make sure the procedure is right for you. The only way you can find out for sure if you’re a good candidate is by meeting with your dentist. 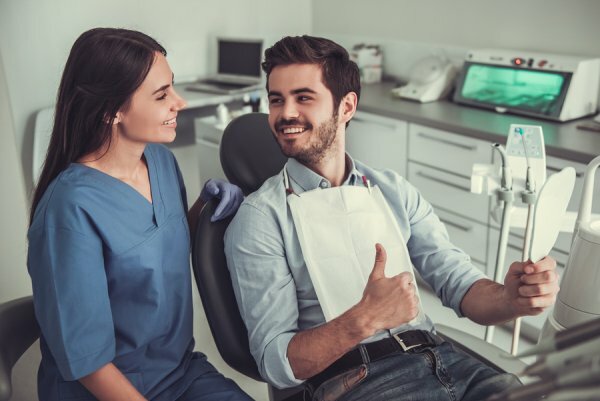 During your initial consultation, your dentist will examine your teeth and gums and may ask you about your medical history and what you hope to achieve. If he or she decides that dental veneers are what’s best for you, you can go ahead and get started on creating a treatment plan. A veneer is a thin cover that goes over your tooth. Your dentist will start the process by removing a small portion of your enamel so there’s room for the veneer to sit. You’ll only have to lose about a half a millimeter of enamel , and it will ensure that the veneer looks natural over your tooth. If you need it, your dentist can administer you a local anesthetic to numb the area he or she will be working on. After prepping the tooth, your dentist will have a veneer created in the lab. In some cases, you might get a temporary veneer. Your permanent veneer will be ready in a couple of weeks, so you can return to your dentist to have it placed. Your dentist will make sure the veneer fits properly and looks the way you want it to. Then, the veneer will be placed on your tooth with an adhesive, and your dentist will cure it. Does it sound like the dental veneer process is what you’ve been looking for? Contact Park 56 Dental to see if you’re a good candidate for veneers . You can also check out our website, or call the team at (646) 783-3529 to make a dentist appointment near NYC today. It’s perfectly reasonable to have questions when you’re considering Invisalign in NYC. If you want to put your mind at ease, get the answers before you start treatment. Watch this video where Alex Aiono answers FAQs about Invisalign. Invisalign is an orthodontic treatment that straightens your teeth without getting in the way. Using a 3D scan, your dentist will create a plan that’s tailored to your personal needs. You can eat the food you want to and play your favorite sports, and you can look at the millions of people who have gone through this treatment for encouragement. If you think you’d benefit from Invisalign in NYC, give Park 56 Dental a call at (646) 783-3529. At our dental clinic, we can use Invisalign to discreetly reposition your teeth, so you can enjoy your smile again. See our website to learn a little bit about us. Root canal treatment was once associated with discomfort, but just like every other aspect of dentistry, this procedure has evolved. A root canal with a top dentist in NYC will alleviate your pain, but it’s up to you to make the appointment and go in for treatment, which means you should know the symptoms. The procedure isn’t nearly as scary as you might think, so continue reading for the answers to your root canal questions. A root canal is done when the interior of a tooth becomes damaged or infected. The infection from a tooth can spread to the rest of the body and contribute to all kinds of complications, so you should deal with an infected tooth as soon as possible. This type of procedure will help you maintain your oral and overall health , improving your quality of life. The most common symptom associated with an infected tooth is pain. A toothache can be a symptom of a multitude of different disorders, so you should see your top dentist and find out what the cause of your symptoms really is. If you and your dentist determine that you need a root canal, your dental health professional will teach you how to prepare for the procedure. A root canal can save your natural tooth and prevent the need for additional restorations. Your dental surgeon will remove the damaged or infected pulp from the interior of your tooth, which will protect your overall health and help decrease your painful symptoms. Then he or she will cap your tooth and seal it off, returning it to normal and protecting the rest of your body. Do you still have questions about root canals in NYC? Feel free to contact Park 56 Dental to have your questions answered. Root canal pain is just one of the many symptoms we can treat, so visit our website to see what our business is like. Learn much more about us by calling our offices at (646) 783-3529. Just one dental implant can change your life, but how do you know if it’s the best choice for you? First, you should talk to a top dentist in NYC. If you decide implants are right for you, you can eat and speak like you did with your natural teeth. You’ll also enjoy a more confident smile, and you won’t have to worry about the aesthetic issues that come with lost teeth. Read ahead and see if dental implants are right for you. Losing teeth will present a handful of problems, which can affect the way you eat and speak . It’s especially tough to speak clearly if you have missing teeth towards the front of your mouth, and chewing your food can become complicated if you’re missing back teeth. It can also be defeating to try to speak words that you’ve said your whole life and pronounce them differently, but dental implants can help this as well. With even one dental implant, your dentist can change your life. You might be worried about how you’re unable to speak or eat properly without your natural teeth, but dental implants can fix the problem. Dental implants will replace your natural teeth, filling out your smile and allowing you to be confident when you interact with people in a social setting. The way you appear and the way you perceive yourself will play big roles when it comes to social interaction, and dental implants can help you feel as good about yourself as you can. Some people don’t realize that losing teeth can actually change the shape of the face. Dental implants replace missing tooth roots and prevent bone resorption. Thanks to dental implants, you won’t have to worry about a sunken-in face. If you’re looking for dental implants in NYC, don’t wait to call Park 56 Dental at (646) 783-3529. Feel free to stop by our dental clinic to learn about our dental bridges, teeth cleaning, and smile restoration services. You can also visit our website for more information.